Big, brawny and luxurious. What are we talking about? 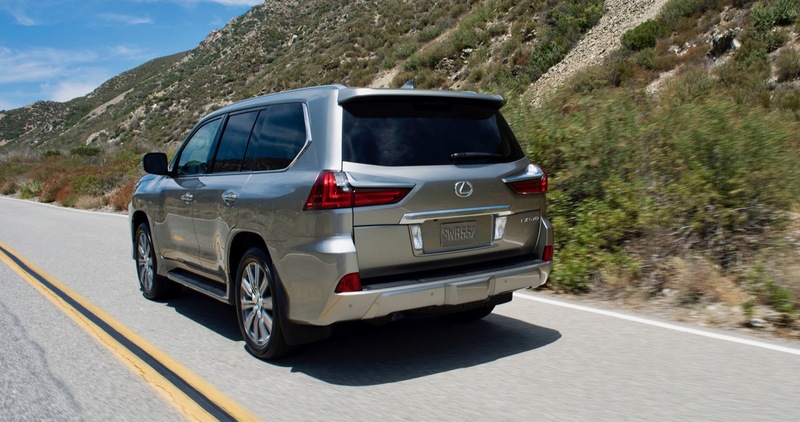 The Lexus LX 570 – the brand’s flagship SUV and the most off-road ready vehicle in its lineup. The LX 570 rivals other luxury flagship SUVs, like the Cadillac Escalade and Lincoln Navigator, but its more rugged underpinnings also make it an excellent rival to the Range Rover. The LX 570 is just as at home transporting the family to the golf course as it is on a weekend off-roading excursion. To start with the 2019 Lexus LX 570 is heavily based on the iconic Toyota Land Cruiser – one of the world’s best off-roading machines, but since the LX 570 has a Lexus badge on the hood, there’s an extra dose of luxury thrown into the mix. Since it shares its DNA with the off-road loving Land Cruiser, the LX 570 can easily out run most other luxury SUVs once the pavement ends. Under the hood you’ll find a 5.7L V8 with 383 horsepower and 403 lb-ft. of torque that’s mated to an eight-speed automatic and a rugged four-wheel-drive system. To help it tackle everything you can throw at it, the LX 570 also features an adaptive suspension with automatic load leveling, Crawl Control to maintain a slow speed off-road, a Multi-Terrain select system and hill start assist. Push it hard and the V8 is easily up to the task to get the 6,200 pound LX 570 moving down the road. While the engine is pretty responsive, it also lets you know that it’s more comfortable taking a relaxed approach. The eight-speed transmission at times can be a bit sluggish. The good news is that the LX 570 can also tow up to 7,000 pounds. Around town the LX 570 suspension does have a bit of body roll and its light steering will keep you from wanting to push it hard around a curve. The Sport and Sport+ settings do tighten up the suspension a bit, but at the expense of ride comfort. Once the road ends, the LX 570 is ready. It’s massive size and large 21-inch wheels make it feel like it can easily tackle any terrain you can find, from a simple muddy trail to climbing over boulders in your way, the LX 570 isn’t phased. The cool crawl control system makes it easy to maintain a slow pace and the adjustable suspension comes in handy when you need a little extra ground clearance. Either on or off road you better make sure you keep an eye on the gas tank. The LX 570 is rated at only 13 mpg in the city and 18 mpg on the highway. Filling it up also won’t be fun, since the LX 570 requires more expensive premium fuel. Inside the LX 570 is all about the luxury. Its interior coddles its passengers in leather with real wood trim applied to the dashboard, center console and doors. The seats are large and cushy with plenty of legroom for front and second row passengers. The third row is mainly meant for kids, since there’s not much legroom way in the back. The LX 570 is available in two versions, either with two or three rows of seats. 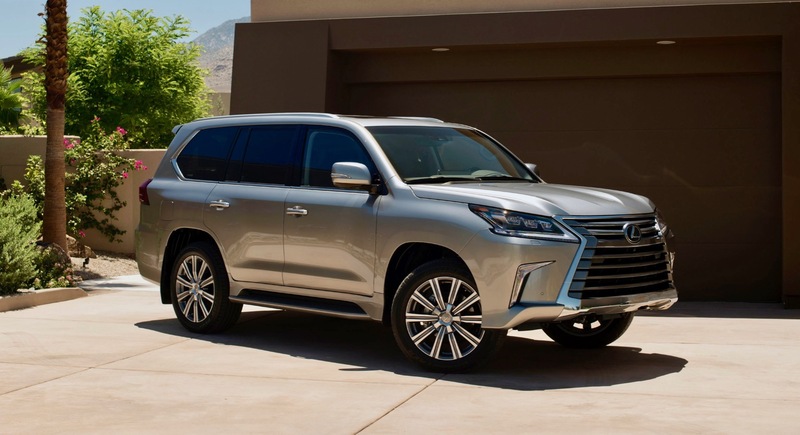 Lexus recently added the five-passenger LX 570 to the options list for buyers that don’t need the extra third row. By deleting the third row, the price of the LX 570 not only drops a bit, but there’s also more space in back for all your gear. With the third row intact, the LX 570 has about 16 cubic feet of cargo space, if you fold it, that number jumps to 45 cubic feet. The two row LX 570 has 50 cubic feet of cargo space behind the second row, which jumps to 140 cubic feet if you lower the second row. The three-row has a bit less total cargo space at 135 cubic feet. 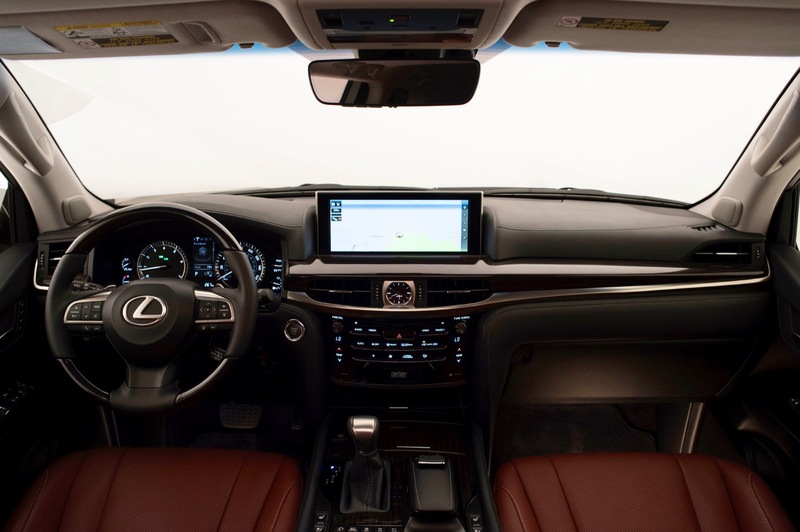 While the Lexus LX 570’s interior is a comfortable place to be, its tech features feel a bit outdated. The LX 570 uses a 12.3-inch screen for its infotainment system. The large widescreen is easy to read, but the infotainment system could be a lot better. To use the infotainment system, you have to use an awkward mouse-like controller, which is distracting when you’re trying make a simple adjustment while zooming down the highway. The system also doesn’t yet offer Apple CarPlay or Android Auto. To keep everyone safe, the LX 570 does offer some of the latest safety tech, like automatic emergency braking, adaptive cruise control and lane departure warning. The LX 570 has an old school hydraulic steering system, which explains why a lane keeping system isn’t offered. 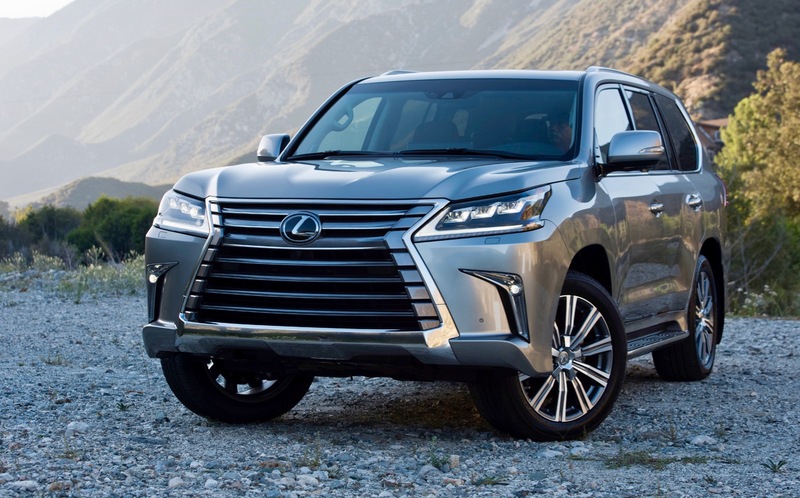 The 2019 Lexus LX 570 starts at $85,830 if you choose the five passenger version or $90,830 if you go with the three-row, eight passenger version. The LX 570 was last redesigned over a decade ago and other than a few styling updates, the it feels more old school than its rivals. Its thirsty V8 packs a decent amount of grunt and long list of off-road tech features make it more ready to tackle the terrain than its rivals. 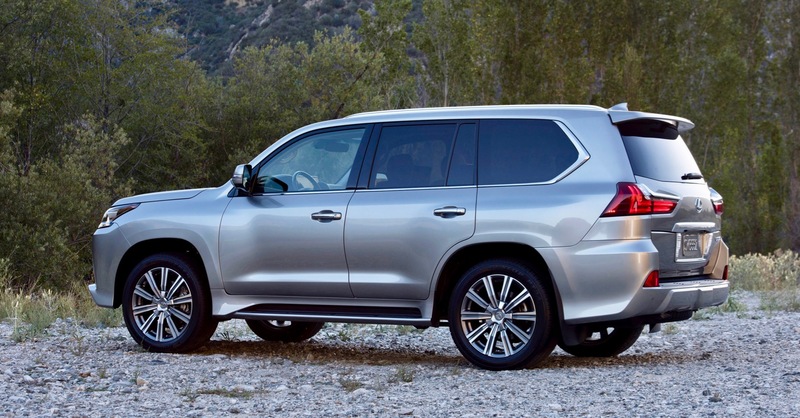 If you want the best of both worlds, luxury and a rugged SUV, you can’t go wrong with 2019 Lexus LX 570.